From January 2005 until December 2010 I served as editor-in-chief of the SIAM J. Scientific Computing. 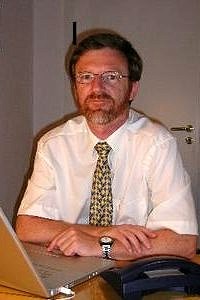 I am also member of the editorial board of International Journal of Parallel and Emergent Distributed Systems, International Journal of Computational Science and Engineering (IJCSE) und des neuen Elsevier Science Journal on Computational Science (JoCS). I am also a member of the SIAM books committee. Since 2011 I am chairing the Zentralinstituts für Scientific Computing , and since 2012 I am director of the Indo-German Winter Academy. From 2012 until 2017 I was appointed to be member of the Forschungsbeirat der TU Kaiserslautern . Since 2012 I am spokesperson of the GAMM-Fachausschusses Computational Science and Engineering (CSE) , and since 2013 I am member of the DFG-Kommission für IT-Infrastruktur (KfR) . Erlangen High-End-Computing Symposium (2006, 2007, 2008, 2009). Siehe auch das GSCI Konferenz-Archiv. New Mathematics for Extreme-scale Computational Science? Large scale simulation of fluid structure interaction usingLattice Boltzmann methods and the "physics engine"
The Bavarian Graduate School in Computational Engineering is a master-level programm of excellence, taught in English, that has been selected in 2004 for the Bavaria’s Elite Network Initiative and receives special funding from there. he degree awarded is a “Master of Science with Honours”. This program offers special courses and intensive individual guidance for highly motivated and talented students. This premium Master degree program is based on the existing International Master Program in Computational Engineering at Universität Erlangen-Nürnberg and is conducted in collaboration with two related programs at Technische Universität München ( CSE und COME ). The courses offered for the elite program can be found via the information system of the university UnivIS. Kungl. Tekniska Högskolan, Stockholm, Sweden. The CE-course is supported within the European Program of Excellence Erasmus-Mundus as one of the partner programs of the Master Course Computer Simulations for Science and Engineering (COSSE). (but only as pdf and only in German). Here you can find my former personal webpage.